Studio Carry On Harry , Singapore : Studio Guest Ouida L. Brown is a Sports Medicine Orthopedic Surgeon who lives and works in Chicago. She is a avid runner. She has run eight marathons, more than eighteen half-marathons, and a plethora of ten-mile, 10k, 8k, and 5k races, In her medical practice, she encourage overall health and fitness through diet and exercise. She also encourages patients to listen to the World of God to inspire them during life's challenges. She is originally from Brookhaven, Mississippi. Ouida L. Brown connected this week with studio host in Singapore to put her book in spotlight for book lovers. 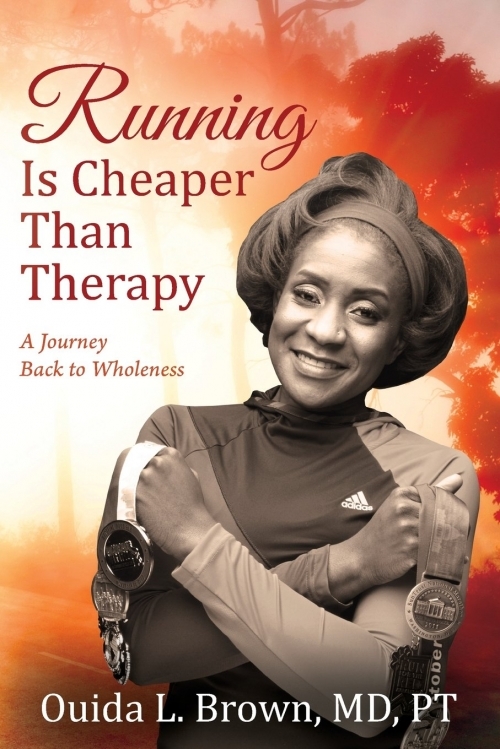 her new book is titled Running Is Cheaper Than Therapy: A Journey Back to Wholeness. Its a book that has her personal memories and at same time it inspires readers to rise above life challenges. Running: So Much More Than Just Exercise: 2008 was the worst year of Ouida Brown's life. Her beloved mother, the heart of her life died of breast cancer. Ouida found herself in a dark place-lost, depressed, and angry. She didn't know who she was anymore...what had happened to her optimism, her energy, her bubbly personality? In her unhappiness, she turned to comfort food, abandoned her healthy eating habits, and gained weight. Her journey back to wholeness came when a trusted friend gently confronted her and told her she needed help. Ouida's path to healing included running along the Penn's Landing Waterfront. As she ran, she realized that running was a discipline and a therapy all its own-yes, it was about fitness and weight loss, but it was so much more than that. Through running, Ouida discovered another way to talk to God, a way to find herself, and the amazing support of a community that shared her passion. Running Is Cheaper Than Therapy is an inspiring story not only of a comeback from life's worst emotional traumas, but also of a comeback from athletic injury, as Ouida confronts and overcomes sports injuries to triumph as a marathon runner.